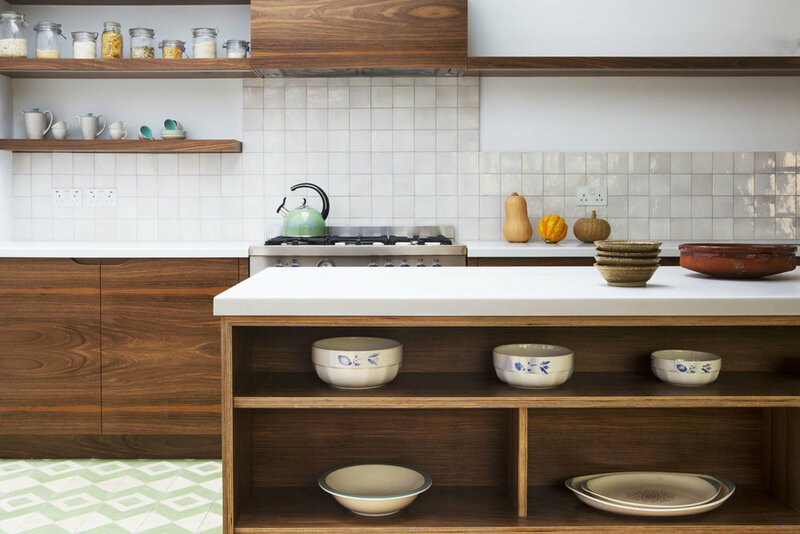 This beautiful kitchen is made with European walnut veneered birch plywood. We suggested this veneer as our clients were having a reclaimed oak parquet through most of their kitchen, and we thought the darker colours in the walnut would make a nice contrast with the light oak floor. European walnut is quite different from its American cousin - with a more interesting and varied grain. The unique design of the island was planned to accentuate the exposed laminations of the birch ply, with the whole island completely framed in veneered birch ply, with the corners of the frame mitred. Continuing that theme, all the drawers in the kitchen were also made from birch ply. We also reflected this design in the spray painted cabinets, with a double thickness mitred ply frame around the units, and a walnut plate in the handles. These units were built flush to the wall, to appear as if they are part of the fabric of the house.